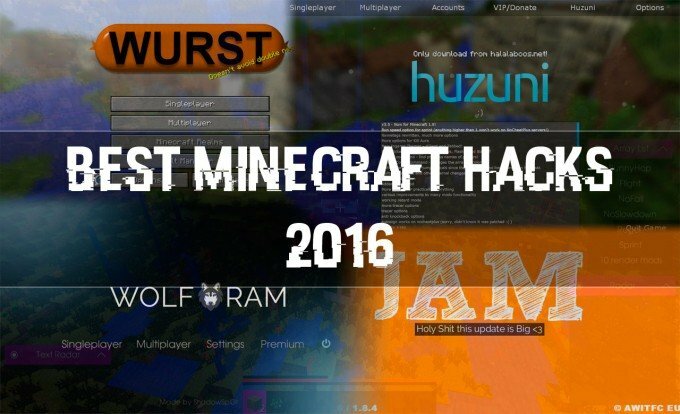 We are well into 2016 and we have compiled the the ultimate best Minecraft hacks of 2016 list, all free to download. Most of these hacked clients are working on the latest version of Minecraft (1.8.X, 1.8.8, 1.8.9, 1.9 etc.). These should be easy to install and have all been tested working. Most of them include loads of mods, that works both offline and online on multiplayer servers. Some of the features might be blocked by NoCheat+, but our experience is that most of the hacks works anyway. You should still use with caution though, you might get banned from your favourite server. Mods can monitor your behavior or they can have installed add-ons which will alert the operators if you find X amount of diamonds in no time (using X-ray). Now lets get to the list, nr. 1 is our best recommendation. Dowload links for all the clients can be found at the bottom. Number one on the list is, of course, the Wurst client! One of our favorite hacked Minecraft client. It gets constantly updated with new features and the source code is free to download. It is PACKED with cheats & mods, so you won’t be missing anything in this client. The new final released version of Wolfram includes all the premium features/mods, without paying for premium! This is one the the most features rich Minecraft hacks we have ever tried. Sad thing is that it might not get updated anymore, but it works for the latest version of Minecraft so far. The client that just get things done. No BS client, works like a charm. Very popular because of this. Originally developed for griefing. Great client with OptiFine, lots of features/mods and easy to install like the other clients. Metro is very popular because of all the features included. Last on the list, but this does not mean it’s bad, not at all! Support for multiple OS, great features for anything – like PvP, griefing, building or whatever you like. Replace ClientName with the actual name of the client. Choose the newly created profile “ClientName″ and click “Play”. Chose the newly created profile “ClientName″ and click “Play”. Chose the newly created profile “ClientName” and click “Play”. Did we forget anyone on the list? Then please leave a comment below.